By the way, did you get your own legendary Grombrindal, the White Dwarf? 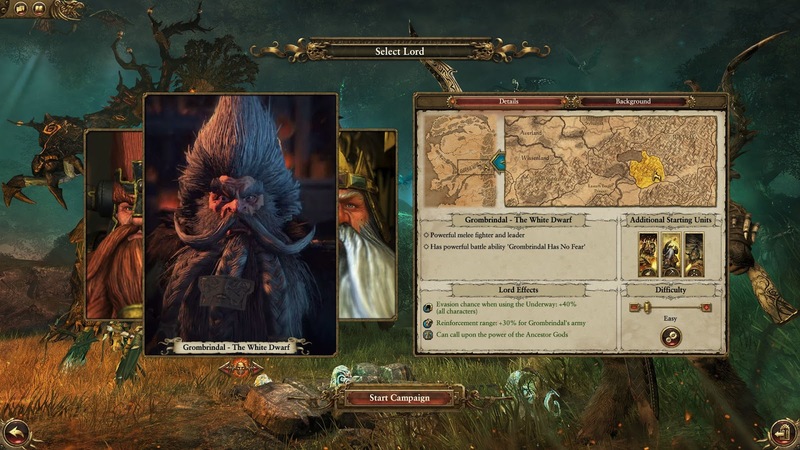 He is now available free on Steam Downloadable Content for Total War: WARHAMMER. Grey Wizard from the Grey Order (Illusionists). Master of magical wind Ulgu, the Lore of Shadows. Jade Wizard from the Jade College (Druids). Master of magical wind Ghyran, the Lore of Life. Actual game picture from Total War: WARHAMMER. Picture taken by Jackdays. See more info from official Total War Twitter and from the Official Site: Total War. Also from official Steam Total War: WARHAMMER. Kalevala Hammer is fantasy site dedicated to Warhammer Fantasy Roleplay material. Please browse freely the site and use information that you might find useful. Also do give feedback. Welcome to "A Grim World of Perilous Adventure". Warhammer Fantasy Roleplay, the Warhammer Fantasy Roleplay logo, WFRP, Chaos, the Chaos device, the Chaos logo, Citadel, Citadel Device, Darkblade, 'Eavy Metal, Forge World, Games Workshop, Games Workshop logo, Golden Demon, Great Unclean One, GW, the Hammer of Sigmar logo, Horned Rat logo, Keeper of Secrets, Khemri, Khorne, the Khorne logo, Lord of Change, Nurgle, the Nurgle logo, Skaven, the Skaven symbol device, Slaanesh, the Slaanesh logo, Tomb Kings, Tzeentch, the Tzeentch logo, Warhammer, Warhammer World logo, White Dwarf, the White Dwarf logo, and all associated marks, names, races, race insignia, characters, vehicles, locations, units, artefacts, illustrations and images from the Warhammer world are either ®, TM and/or © Copyright Games Workshop Ltd 2000-2019, variably registered in the UK and other countries around the world. Used without permission. No challenge to their status intended. All Rights Reserved to their respective owners. Unless otherwise indicated, all content Copyright © 2019 Kalevala Hammer. All rights reserved. Unless otherwise indicated, all materials on these pages are copyrighted by the Kalevala Hammer. All rights reserved. No part of these pages, either text or image may be used for any purpose other than personal use. Therefore, reproduction, modification, storage in a retrieval system or retransmission, in any form or by any means, electronic, mechanical or otherwise, for reasons other than personal use, is strictly prohibited without prior written permission. All names, trademarks, and images are copyright of their respective owners. See copyright & legal-disclaimer.